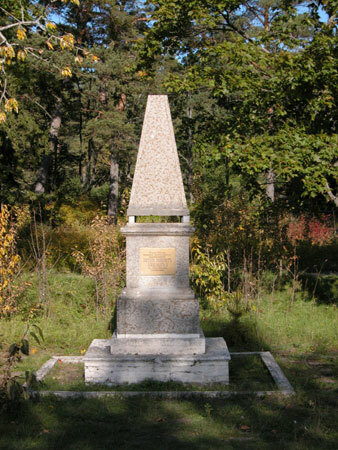 In this and the following few albums we will visit the Konevets island. Few tourists know about it - mostly due to the difficulty in getting there. 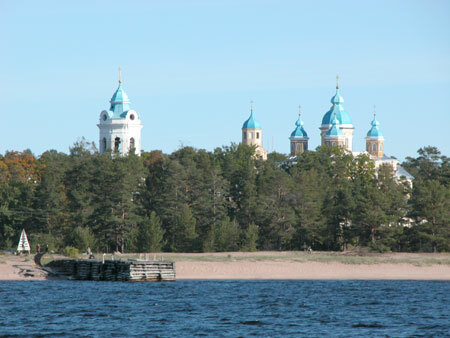 The island, located 5 kilometers off shore on the Ladoga lake, is know for its active monastery and hermitages. 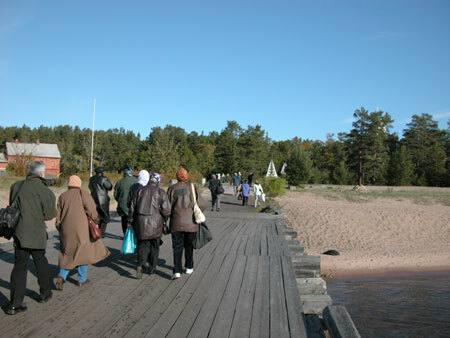 The usual way of getting to the island is to take a car to the Vladimirovka village (a two hour drive from St. Petersburg), and then a cutter to the island. 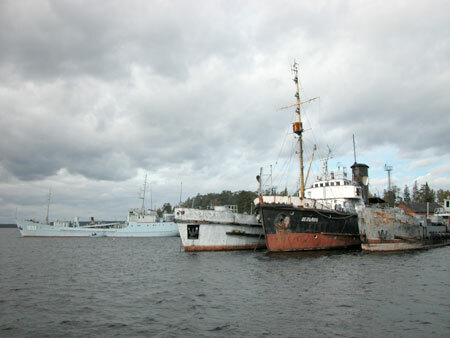 The village has a Navy base, apparently mostly abandoned long ago (see the photo) with only the check point partially operational. 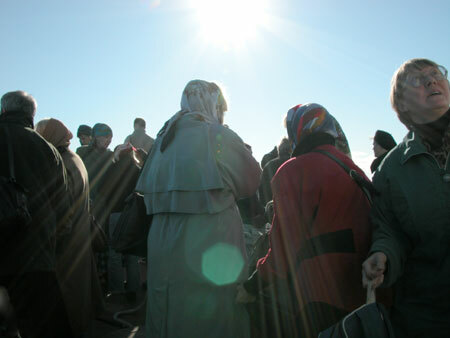 Some people got there in a less civilized fashion: by train to Sosnovo, then by bus to Vladimirovka, and then the cutter. Lord knows how this latter sails; there is also a chance of not being allowed on board. In winter one can just walk across the ice. In the event the cutter was completely filled with pilgrims. Prayers were heard non-stop throughout the sailing. There were but a few tourist, some of them foreigners, for whom the trip must have left some very strong impressions (starting with the boarding, which required us to make our way through the completely rusted-out ship with high sides seen in the photo above). After a half-hour to an hour of sailing we arrived at the island. 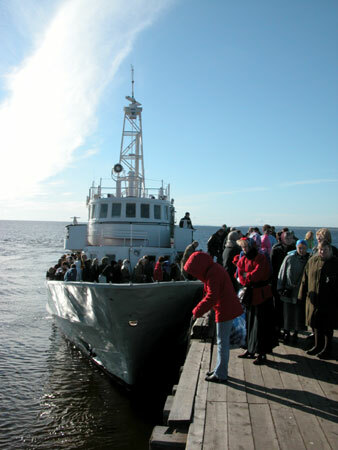 It is small (as compared to Valaam) - 5 by 2 kilometers, and thus the main sights can be seen between cutter launches. 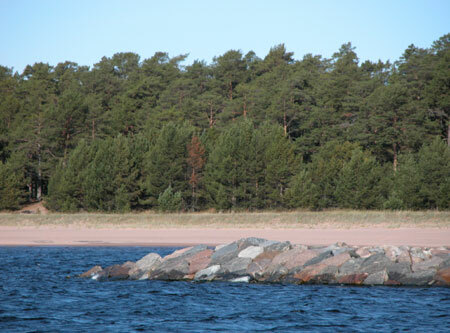 The island is called Konevets because of the great 'Steed' stone located there. 'Kon' is Russian for 'steed'. More on this later. 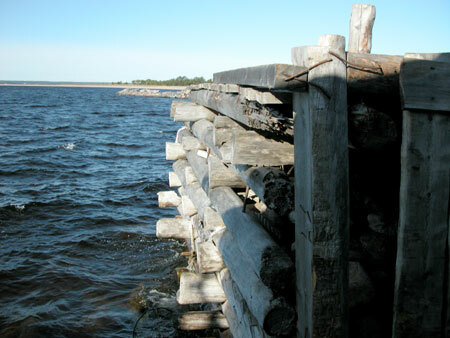 The pier is filled with stones to keep it in place. There is no tourist infrastructure, as there has never been many tourists here. There are a couple of traditional (for us) wooden pile outhouses, which are rather original in appearance (I forgot to film them). There is also a hostel for the pilgrims. 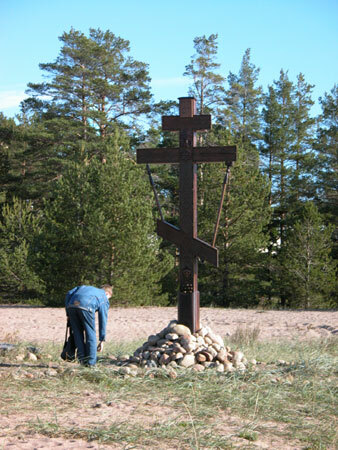 Some people went directly to pay homage at the different holy spots. An alternative. 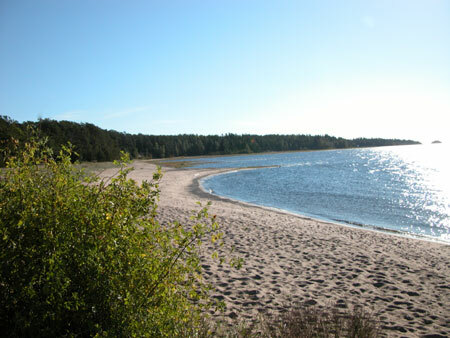 "On June 28, 1858, the Konevets monastery was visited by the Most Pious Sovereign Emperor Alexander II and the August Family"
Along this part of the island stretches a sandy beach. We got very lucky with the weather: there was sun and a moderately strong wind, which made the water look nice. The next album will concentrate on the monastery and its immediate environs.